St Paul's chapel is the oldest surviving church on Manhattan, having survived the fires of 1776, 1835 and 1845. It was built as a chapel-of-ease in 1766 by architect Thomas McBean to serve members of the New York parish who lived at a distance from Trinity church further down on Broadway. In the back can be seen 195 Broadway, built as headquarters for American Telephone and Telegraph in 1916 by William Bosworth, on the former site of the Western Union Telegraph building, which briefly held the title as tallest office building in New York in 1875. Further back stands One Liberty Plaza completed in 1973 by Skidmore, Owings and Merril, which replaced the City Investing Building and the Singer tower, the first New York skyscraper to hold the title as tallest building in the world. Stuyvesant Street is the only remainder of Bowery village, created by a descendant of the Dutch colonial governor Peter Stuyvesant at the end of the 18th century. The 17th century Stuyvesant mansion burned down in 1778 but the Stuyvesant family still owned most of what is now East Village and created a little town just outside the city's borders. Unlike the 1811 grid plan, the Bowery streets were laid out in a grid following the cardinal directions and Stuyvesant Street is now at a diagonal to the surrounding streets. The oldest of the houses is from 1803 and can be partially seen on the left but the other town houses in the picture were built in 1859-61 to a design by James Renwick Jr. The towers in the back on 2nd Avenue are art-deco buildings from the late 1920s. St Mark's-in-the-Bowery was built in 1795-99 to serve the Bowery village, replacing a Stuyvesant chapel from the 17th century. The original design was by John McComb Jr, while the steeple was added in 1828 by Martin Euclid Thompson and Ithiel Town. The porch is from a renovation in 1836. New York City Hall is the city's third city hall and the oldest in the United States to retain governmental functions. It was built in 1810-12 by architects John McComb Jr. and Joseph Francois Mangin who won a competition in 1802. The process was delayed due to objections from the city council and the architects were forced to make some cost-saving measures such as restricting the use of marble, using brownstone on the rear elevation. The entire structure has been reclad in limestone since 1954-56. 17 Grove Street from 1822 is considered the best preserved example of wood-framed houses in Greenwich village. Wood-framed houses were banned in 1866 but this didn't prevent the addition of a third storey in 1870. At the the back can be seen the house known as Twin Peaks, built in 1835 but redesigned by amateur architect Clifford Reed Daily in the 1920s. On the right, the mansion block 19-21 Grove Street was built in 1891 by Bruno Berger. Greenwich village existed as a hamlet already in the 17th century and developed separately from the rest of New York. Its layout is largely independent of the New York grid and most streets are named instead of numbered. 88-90 Grove Street were both built in 1827 and are examples of the many new townhouses that sprang up in Greenwich village after a yellow fever epidemic broke out in New York proper in 1822. Neither building has been left untouched. Number 88 was redesigned in French-inspired style in the 1860s, notably with the addition of mansard roof and dormers, while number 90 was remodelled to house an artist's studio in 1893, by architects Carrere and Hastings. There were once similar townhouses on the neighbouring plots but these have been redeveloped, the building on the right was built in 1885 while the one on the left was built in 1917. The first US customs house was completed in 1842 after more than 10 years of construction to a classical design by architect John Frazee. It replaced a building from 1788 by Pierre Charles l'Enfant, which briefly served as the first US Congress but was relegated to the function of city hall when the capital moved to Philadelphia in 1790. It was demolished in 1812 when the new city hall was completed. The earliest building on the site was built in 1700 as New York's second city hall. The building on the left with ionic columns is the base of a skyscraper, built in 1910-12 by architects Trowbridge and Livingstone for the Bankers Trust Company. In a period of intense redevelopment, the first skyscrapers had a short lease on life. The 83-metre Gillender Building, which was demolished to make way for Bankers Trust, was built as recently as 1897 and was then the tallest ever to be torn down. Bankers Trust built a second tower on the adjacent plot to the north in 1931-33 by architects Shreve, Lamb and Harmon. This caused the destruction of another skyscraper, the 117-metre Hanover National Bank from 1903. Even further up Nassau Street can be seen the Equitable Building from 1915 by Ernest Graham, a controversial building that prompted the 1916 zoning resolution requiring setbacks for tall buildings to allow sunlight to reach street level. The previous Equitable Building was destroyed in a fire in 1912. Built in 1870 to a height of 40 metres in a fairly conventional French-inspired design and with no structural steel, it is still considered by some as the world's first skyscraper. Wall Street is supposedly named after the palisades and later fortifications that Dutch colonists built to protect Nieuw Amsterdam. At the top of the street stands Trinity church, built in 1839-46 by architect Richard Upjohn. Two previous churches have stood at the site, the first was constructed in 1698 but was destroyed in the fire of 1776, the second was completed in 1790 but was weakened by severe snows in 1838-39 and subsequently demolished. With 85 metres to the top of the spire, the third Trinity church was the tallest building in New York until the first skyscrapers were completed in the late 19th century, though it was briefly surpassed by the Latting Observatory, completed in 1853 but reduced in height in 1854 and burned down in 1856. Having completed the design of the first Bankers Trust Building, Trowbridge and Livingstone went on to design 23 Wall Street (1913) and the extension to the New York stock exchange (1923), meaning that the same firm is responsible for three of the four corners of the intersection Wall Street and Broad Street/Nassau Street. Trowbridge and Livingstone also built 15 Broad Street in 1928. Grace Church was built in 1843-46 and was the first major commission of James Renwick jr. It was built from marble quarried by inmates from Sing Sing prison and is one of the first works of neo-gothic in New York. The spire was originally in wood but was replaced with a marble spire in 1881 partly as a response to the suspicion that the choice of wood had been due to a structural fault rather than lack of funds. Renwick also built a rectory during the first building campaign and a series of similar buildings were later added, including Grace House (1881), Memorial House (1882), Clergy House (1903) and Neighbourhood House (1907). A chantry and extension of the chancel have also been added to the church. The tower in the back was built in 1926-29 to a design by architect Warren and Wetmore as an extension to the Consolidated Gas Company Building from 1914 by Henry Hardenbergh. The building on the left is from 1960 on the former site of the "iron palace" built by John Kellum in 1862 and enlarged 1870, for A.T. Stuart & Company. The building was slated for demolition and was destroyed in fire in 1956 but the 1906 John Wanamaker annex by Daniel Burnham still stands south of Wanamaker Place. A.T. Stuart had also opened a "marble palace" on the former site of Washington Hall at 280 Broadway in 1846, expanding multiple times in the period up to 1884. E. V. Haughtwout Building, on the corner of Broadway and Broome Street, was built in 1857 and features a cast-iron facade by John P. Gaynor. It was a commercial building commissioned for Haughtwout's cut glass, china and silverware business and featured the world's first passenger lift, though this only lasted to 1860 as most customers apparently felt more comfortable taking the stairs than the noisy lift. The red-brick building on the other side of Broome Street is 486 Broadway, designed by Lamb & Rich in 1883. The Old New York County Courthouse, known as Tweed Courthouse, was built in 1861-72 by architect John Kellum. The project was left unfinished due to a corruption scandal and the rear wing and interior was only completed in 1877-81. The cost of building had grown exponentially as member of New York State Senate William Tweed and his circle were accused of using the project to embezzle funds. The new architect Leopold Eidlitz departed from the classical style of his predecessor and created interior decorations inspired by medieval and organic forms. It is the only other building in city hall park since the 1880 Post Office and Courthouse was demolished in 1939. The skyscraper under construction on the left is 5 Beekman Street, to be completed in 2017. The adjacent Temple Court from 1883 is be restored as part of this development. The previously residential areas north of Canal Street, Tribeca and Soho (South of Houston Street), were redeveloped in the second half of the 19th century and the old townhouses were replaced with commercial buildings. The development coincided with the growing use of cast-iron facades, pioneered by architect James Bogardus in 1850, as a cheaper alternative to stone or masonry. Some of these facades are very ornate. 32-34 Greene Street and 28-30 Greene Street, the latter known as the Queen of Greene Street, were built in 1972-73 as store and warehouses. The architect was Isaac Duckworth, except number 34 which was designed by Charles Wright. Duckworth also designed the King of Greene Street at 72 Greene Street, a similarly French-inspired design with mansard and dormers. The clock tower on 6th Avenue in Greenwich Village has crowned a library since 1967 but was originally part of a courthouse from 1874-77, by architect Frederick Clark Withers. It is the only remaining of a complex of buildings, also consisting of a prison and market. The market was demolished in 1927 and the prison was replaced with a new structure in 1931. The latter, believed to be the only art deco prison in the world, was demolished in 1973. The courthouse building was also threatened with demolition but was saved due to public outcry and became one of the first adaptive reuse projects in the United States. The Jefferson Market was originally created in 1832 and a wooden tower for fire lookout was the first structure to be built on the site of what is now Jefferson Market Library. 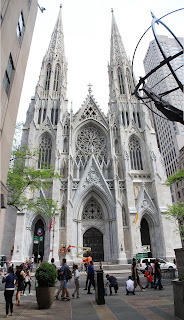 St Patrick's Cathedral was built in 1858-79 to a design by James Renwick Jr. The spires were added in 1888 and reach 15 metres higher than Trinity Church, making St Patrick's the tallest building in New York until the 106-metre World Building was completed in 1890. Various adjacent buildings, including the archbishop's house, rectory and a school (now demolished), were completed in the 1880s while an extension to the east including a lady chapel was begun in 1900. The new cathedral replaced St Patrick's Old Cathedral on Mulberry Street, built in 1809-15. Brooklyn Bridge was completed in 1869-83 to a design by German-born engineer John Augustus Roebling. Having worked on the design since 1867, Roebling suffered an accident and died during the first year of construction, leaving the project to his son Washington Roebling. Washington was later incapacitated by decompression disease and had to rely on his wife to relay instructions to engineers on site. It is the first steel-wire suspension bridge and was the longest suspension bridge in the world until Williamsburg Bridge was completed in 1903. Greene Street in Soho has one of the highest concentrations of cast-iron facades from the late 19th century. Most of the buildings between Houston Street and Prince Street were built in 1882-86 by architects Henry Fernbach, William Baker, Jarvis Morgan Slade and Alfred Zukor. The brick facade on the right is by Detlef Lienau from 1881. In the distance can be seen several skyscrapers, including 56 Leonard Street, under construction to a design by architect Herzog & de Meuron, and 4 World Trade Centre, completed in 2013 to a design by architect Fumihiko Maki. Washington Arch was built in 1892 to a design by Stanford White, replacing a plaster and wood arch erected in 1889 for the centennial celebration of George Washington's inauguration as the first president of the United States. White's design was modelled on the Arc de Triomphe in Paris. In the distance can be seen Empire State Building, the world's tallest building from 1931 to 1971, then succeeded by the World Trade Centre North Tower. The art-deco tower on the right was built in 1927 to a design by Harvey Wiley Corbett. The north side of the square is dominated by a row of brick townhouses built in the 1830s. Known as the Silk Exchange Building, 487 Broadway (far right) is located on Broome Street stretching from the corner of Broadway to Mercer Street. It was built in 1894-96 to a design by the developer John Townsend Williams, who had previously worked in collaboration with the architect William Birkmire to create Lord's Court Building on Williams Street and the Central Bank Building. Most of the the original tenants were silk merchants but the building has also been known as the Haggin Building after James B. Haggin who acquired the building in 1899. It was converted to flats in 1985. The picture is taken from the corner of Broome and Lafayette and includes a number of low-rise building including 419-421 Broome Street (left), built in 1873-74 by Griffith Thomas for Scovill Manufacturing Company. The company expanded with the construction of 423 Broome Street on the adjacent plot in 1884 by architects D & J. Jardine. On the corner of Crosby Street stands the cast-iron facade of 425 Broome Street, built in 1875 by Edward H. Kendall. As we cross the street, we enter into Soho. The corner building of 429 Broome Street is from 1859 while 431 Broome Street is from 1825 and was recently converted into a hotel. The two cast-iron facades of 433-435 Broome Street were built in 1827, though the facade is a later redesign, and 1873, the latter by W. A. Potter. The Gertrude Rhinelander Waldo House was built in 1895-98 to a design by Alexander Mackintosh working for architects Kimball and Thompson. The residence was commissioned by Waldo, but she never actually moved in and the house stood vacant until 1921. It was then converted to mixed use with stores on the ground floor and flats above. The church next door, St James' Episcopal church, was completed in 1885 to a design by Robert Henderson Robertson, replacing a previous church on East 72nd street by James Renwick from 1869, itself a replacement of a church from 1810. A gothic belfry was added by Ralph Adams Cram in 1926 but this was removed due to structural difficulties in the 1940s and the current steeple is from 1950. The Oliver Gould Jennings House and Henry T. Sloane House on East 72nd Street were built in 1894-96 and 1898-99. The Sloane House (right) was built to a design by architect Carrere and Hastings, while architects Flagg and Chambers followed a few years later with a similar style, making the houses look like a single unit. The Jennings house housed the Guggenheim collection from 1957-59 at the same time as it hosted the Danish delegation to the United Nations. Both houses became property of the French school in New York in the 1960s and were joined. They were sold in 2010 and have now been reconverted to housing. The Bayard-Condict Building from 1897-99 is the only design by Chicago architect Louis Sullivan in New York. The building is located in the NoHo district and was completed in cooperation with associate architect Lyndon P. Smith. Considered father of the modern skyscraper, Sullivan was not the first to build tall or to use structural steel. He believed that tall buildings should embrace new design principles with an emphasis on vertical lines and ornament largely restricted to ground floor and top storey. In this, he arguably drew inspiration from the 40-metre proto-skycsraper built by William Johnston in Philadelphia in 1849-50, known as the Jayne Building. The Wainwright Building in St. Louis (1891) and the Guaranty Building in Buffalo (1894) are typical examples of Sullivan's style and stand in contrast with New York's contemporary skyscrapers, such as the New York Tribune (1875), the New York Evening Post Building (1875), the Potter Building (1883), the World Building (1890), the Postal Cable-Telegraph Building (1894) and Manhattan Life Insurance (1894). The Harry F. Sinclair House was built in 1897-99 by architect Charles Gilbert for banker and stockbroker Isaac Fletcher. The oil millionaire Harry Sinclair purchased the house in 1918 and lived there until 1930. It has been owned by the Ukrainian Institute of America since 1955. The Stuyvesant Fish House on the corner of 78th Street and Madison Avenue is an Italianate mansion designed by Stanford White of architects McKim, Mead and White. It was built in 1898-1900 on commission from Stuyvesant Fish, an industrialist and financier. The residence was first used for offices in the 1930s but reverted to a private home in the 1940s. It wasn't fully converted to office use until 1985 when all remains of the original interior were removed. 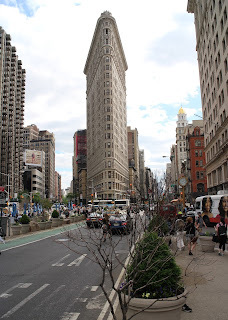 The Flatiron building from 1902 by Daniel Burnham was never the tallest skyscraper in New York or the tallest building north of 14th street, as that title was held by the 94-metre Madison Square Garden Tower inspired by the cathedral of Seville. However, the Fuller Building, as it was officially known, quickly became the symbol of the New York skyscraper. The cupola on 5th Avenue belongs to the Sohmer Piano Building from 1898 by Robert Maynicke. The NYC stock exchange was built in 1901-03 to a design by architect George B. Post, replacing a previous building from 1865. The extension on right was built in 1919-23 by architects Trowbridge & Livingston, replacing two early high-rise buildings from the 1880s, the Mortimer building by George Post and the Wilks building by Charles W. Clinton. The building from 1865 was the stock exchange's first permanent home but it can trace its history back to 1792. The Whitehall building, named after a 17th-century Dutch Director-General's home once located nearby, was built in 1902-04 to a design by architect Henry Hardenbergh. The office building was built speculatively but proved very successful and an additional building known as Greater Whitehall was added to its rear in 1908-10 by architects Clinton and Russell. It was the largest office building in New York at the time of its completion. On the left, 19-21 West Street are both Art Deco towers built in 1929-31 by architects Starrett & Van Vleck. The Singer Building at 561 Broadway was built in 1902-04 to a design by Ernest Flagg, the same architect who would later build the more famous Singer Tower in 1908 for the same company. The 187-metre skyscraper was demolished in 1968 and is the tallest building in the world to have been purposely demolished by its owner. Known as the Paul Building or Little Singer Building to distinguish its more famous namesake, the older building has facades on Broadway and Prince Street. The neighbouring building was built in 1860 by John Kellum for the jewellery company Ball, Black and & Co. It was raised by four additional storeys after it it was acquired by Charles and Moritz Freedman. Surrogate's Courthouse, previously known as Hall of Records, was built in 1899-1907 to a design by John R. Thomas and was completed after his death in 1901 by architects Horgan & Slattery. When Thomas won the commission in 1888, the plan had been to demolish the city hall and replace it with a new building. This was abandoned due to public outcry and the winning design was modified to become the new hall of records. The building was designed to include the Surrogate's court and courtrooms were created on the fifth floor. The court later expanded and the current name was officially adopted in 1962. The building on the right is the former Emigrant Industrial Savings Bank building from 1909-12 by Raymond Almirall. It was the third building by the bank on the site and was the biggest bank building in the United States in its time. It was also the first skyscraper to use an H-layout to provide more light and air to all parts of the building. The former New York City Police Headquarters was built in 1905-09 to a design by architects Hoppin & Koen. The New York police moved out in 1973 and the building was converted to flats in 1988. The building is now known as the Police Building Apartments. Manhattan Bridge was the last of the three suspension bridges across the lower East River and was completed in 1909, to a design by engineer Leon Moisseiff. It was the first to use Josef Melan's deflection theory for the stiffening of its deck and the first to use a Warren Truss in its design. The arch and colonnade at the bridge's entry was added in 1912-15 to a design by architects Carrere and Hastings. Williamsburg Bridge to the north was completed in 1903 and was the longest suspension bridge in the world until 1924. It was not the longest bridge in the world however as suspension bridges have only held that title since Ambassador Bridge from Detroit to Windsor in Canada was completed in 1929. The first design for a new cathedral in New York was made in 1888 in a byzantine-romanesque style by architects George Lewis Heins and Christopher Grant Lafarge and construction began in 1892. But the gothic style that later evolved is from after 1909 when Ralph Adams Cram took over as architect. Work on the facade began in 1925 and the cathedral was opened end-to-end for the first time in 1941. Work has slowed since WWII and though some progress was made in the the last decades of the 21st century, the cathedral is still nicknamed St John the unfinished. Grand Central Station was built in 1903-13 to a design by architects Reed & Stem and Warren & Wetmore. It was the third train terminal building on the site following the Grand Central Depot from 1871, designed by John B. Snook, and Grand Central Station from 1899-1900, which had been an expansion and redesign of the original building by Bradford Gilbert. Grand Central is often compared with the Pennsylvania Station building from 1910, designed by architects McKim, Mead and White, which was demolished in 1963. The skyscraper behind Grand Central was built in 1958-63 as the PanAm building and is now known as the MetLife building. The architects were Emery Roth & Sons, Pietro Belluschi and Walter Gropius. Also on the axis of Park Avenue stands the Helmsley Building, opened as New York Central Building in 1929 to a design by Warren and Wetmore. The Woolworth building was built in 1911-13 to a design by the architect Cass Gilbert as the headquarters of the retail company F.W. Woolworth. It was the tallest skyscraper in the world until 40 Wall Street was completed in 1930. It was originally designed to reach 130 metres but eventually grew to 241 metres. The skyscraper under construction is 30 Park Place, designed by Robert A.M. Stern Architects. Completion is expected in 2016. Henry Clay Frick House was built in 1912-14 to a design by Thomas Hastings, replacing the Lenox library building from 1877 by Richard Morris Hunt. The industrialist Henry Clay Frick had originally wanted Daniel Burnham to design his mansion and Burnham did submit designs but these were not carried out. Frick willed the house and all its contents to the public to be used as a museum at his death in 1919. His family continue to live in the mansion and the museum was first opened in 1935. The house was enlarged in 1931-35 as part of this process and was enlarged again in 1977 and 2011. Frick at one point also leased the Vanderbilt house on 5th avenue, the largest private residence ever to be built on Manhattan, now demolished. The Manhattan Municipal Building was built in 1907-14 by architects McKim, Mead and White and was the first building in New York to incorporate a subway station. The need to expand office space for the municipal authorities was prompted by the consolidation of the city into 5 boroughs in 1898. This building, on the corner of 5th Avenue and 86th Street, was built in 1914 to a design by architect Hastings and Carrere for industrialist William Starr Miller. It has been home to the Neue Galerie New York since 2001 after the building was renovated and restored by architect Annabelle Selldorf. The gallery is a museum for early 20th century German and Austrian art. The view from Union Square reveals two skyscrapers that once held the title of tallest in world. The Metropolitan Life Insurance Company Tower by Napoleon Lebrun and Sons was built 1909 and ceded the distinction to the Woolworth Building in 1913. Empire State Building by architects Shreve, Lamb and Harmon held the title considerably longer, from 1931 to 1970. The newcomer in between is One Madison by architects Cetra/Ruddy (2013). The square was first urbanised as Union Place in the 1840s when fashionable residences first began to appear at what was then the northern fringe of the city. It is now mostly dominated by mid-rise buildings from the early 20th century. On the left, 17-19 Union Square West was built in 1913 by architect Charles Volz, the adjacent student residence hall was built in 1987, the Bank of Metropolis Building was built in 1903 by architect Bruce Price and the Decker building was built in 1892 by John Edelmann. Behind the trees lurks the Century Building from 1881. On the right stands the Everett building from 1908 by architects Goldwin and Starrett, on the site that previously belonged to the once fashionable Everett Hotel, and the Germania Life Insurance building from 1910. The commission to build a new courthouse for New York county was won by architect Guy Lowell in 1913 but construction only began in 1919 due to WWI and was completed in 1927. The hexagonal plan was introduced during revisions of Lowell's original plans in the years before construction got underway. 26 Broadway was originally built in 1885 as the Standard Oil headquarters but was later extended in 1895 and virtually rebuilt in 1921-28 by architect Thomas Hastings and associates Shreve, Lamb and Blake. Below on the left stands 1 Broadway, formerly known as the United States Lines-Panama Pacific Lines Building. It was originally built as an ornate commercial structure known as the Washington Building in 1884 to a design by Edward Kendall, but the facade was remodelled in 1921 by Walter Chambers for the International Mercantile Marine Company. The house that previously stood on the plot was known as the Kennedy Building and is famous for briefly serving as headquarters for George Washington during the American Revolution. The high-rise on the right (2 Broadway) was built in 1958-59 to a design by Emery Roth and Sons, replacing the Produce Exchange Building from 1884 by George Post. Alexander Hamilton Custom House (behind the trees on the right) was built in 1899-1907 by Cass Gilbert. The Chrysler Building was built in 1928-30 and was the tallest building in the world for 11 months, surpassing 40 Wall Street, until the completion of the Empire State Building in April 1931. It was built for the fonder of the Chrysler Corporation Walter P. Chrysler to a design by architect William van Alen and served as the Chrysler headquarters until 1953. The tower is still the world's tallest steel-supported brick building. 570 Lexington Avenue, originally know as the RCA Victor Building, was completed in 1931 to a design by architects Cross & Cross. It was later renamed General Electric Building but is now usually referred to by address to avoid confusion with the GE building at Rockefeller Centre. RCA had also moved to Rockefeller when the company vacated Lexington Avenue. The colour of the brick harmonises with the neighbouring St Bartholomew's Episcopal Church from 1918 by Bertram Goodhue. A church portal from 1903 designed by Stanford White, which had been added to the previous church on Madison Avenue from 1872-76 by James Renwick, was preserved and re-erected on the new site. The Eldorado is the northernmost of four twin-towered mansion blocks on the Upper West side, the others being the Majestic, San Remo and The Century. The Eldorado was built in 1929-31 to a design by Margon and Holder, replacing a previous eight-story block from 1902. The Wall Street crash of 1929 hit the project hard, and the speculative build was foreclosed on soon after completion. The metal finials of the towers are a design by Emery Roth, the architect behind San Remo. Both the Century and the Majestic were designed by Irwin Chanin and Jacques Delamarre in 1930-31. The Century is named after Century theatre, a building by Carrere and Hastings from 1909. The buildings are cooperatives, meaning that residents hold the title to property and housing structure in common. The same is also true of the Dakota, one of the first mansion blocks on the Upper West Side and named for its then remote location. It was built in 1880-84 by Henry Hardenbergh, who also completed Plaza Hotel in 1907. Thurgood Marshall United States Courthouse: Architect Cass Gilbert was commissioned to build a new federal courthouse in 1931 and his design was completed in 1933-36. The tower reaches to just under 180 metres. Rockefeller Centre is at its core a complex of 14 art-deco buildings built in 1930-39 by a team of architects headed by Raymond Hood. John D. Rockefeller jr was the sole financier behind the project after he failed to establish a syndicate to build a opera house for the Metropolitan Opera on the site. The complex expanded west of 6th Avenue with the completion of the Time-Life Building in 1959. Three more towers, dubbed the XYZ buildings, were completed in 1969-73. All four of these additions were designed by Wallace Harrison, who also happens to be the architect behind the Metropolitan Opera House at the Lincoln Centre for the Performing Arts. The last addition to the Rockefeller Centre was completed in 2001 to a design by Kohn Pedersen Fox Associates. The main entrance of the Museum of Natural History was built in 1936 to a design by John Russell Pope as part of a memorial to Theodore Roosevelt. On the left can be seen one of the corner turrets of the pre-existing museum building from 1891 by architects Cady, Berg and See, part of a design for a massive four-winged museum complex that was never fully carried out. This enveloped the original building from 1877, by Jacob Wrey Mould, to which the museum moved from its original location in the Arsenal Building in Central Park, where it had been since it was founded in 1869. On the left can also be seen one of the towers of the San Remo, built in 1929-31 by architect Emery Roth. St Andrew's Roman Catholic church was built in 1939 after a fire 1930 led to the demolition of the previous church in 1937. The previous church had been dedicated in 1842 and remodelled in 1861 at a time when the area was still an infamous slum known as Five points. The architects behind the new church were Maginnis and Walsh and Robert Reiley. The tower on the right is the Daniel Patrick Moynihan United States Courthouse, built in 1994 by architect Kohn Pedersen Fox. The headquarters of the United Nations was built on the site of a previous slaughter house on the East River in 1948-52. A team of international architects were commissioned to develop proposals in 1947, a process which culminated in a project by Oscar Niemeyer, incorporating ideas presented by Corbusier. The Dag Hammarskjold Library Building was added to the complex in 1961, to a design by architect Harrison and Abramovitz. The building and surrounding land is technically outside US direction. The Solomon R. Guggenheim Museum was completed in 1959, six months after the death of its architect Frank Lloyd Wright. The museum was established in 1939 under the name Museum of Non-objective Painting and was renamed in honour of its founder in 1952. The collection was housed in rented space until the completion of the purpose-built venue. Lloyd Wright was asked to provide a design for a building in 1943 and the architect produced the first sketches and alternative ideas during this period. One Times New Square was originally built in 1904 to a design by architect Cyrus Eidlitz, replacing a previous building from 1899 known as Pabst Hotel. The newspaper was previously housed at 41 Park Row where it had its own building from the 1850s replaced with a skyscraper designed by George Post in 1889. The New York Times moved out in 1913 and One Times New Square was later acquired by Allied Chemical, which remodelled the facade in 1963, covering the original terracotta and granite facing with marble. The front has been covered in billboards since the 1990s and tenants are secondary to its income. It was once the tallest building in the vicinity but is now surrounded by taller buildings, including the Conde Nast Building from 2000 by Fox & Fowle (left), the Times Square Tower from 2002-04 by Skidmore, Owings and Merrill (directly behind), the Thompson Reuters Building from 1998-2001 by Fox and Fowle (right) and 5 Times Square from 2002 by Kohn Pedersen Fox (also right). Also visible on the left is the Knickerbocker hotel from 1906 by Bruce Price and Marvin & Davis and the Continental Building from 1931 by Ely Jacques Kahn, and on the right the Navarre Building from 1930 by Sugarcane & Berger, which replaced Hotel Navarre from 1900 by Barney & Chapman. West street separates Battery Park City (left) from the rest of the financial district of lower Manhattan. Battery Park City is built on reclaimed land, a master plan for the area was unveiled in 1969 and the landfill was completed in 1976. Construction began in 1980, 23 buildings were completed in the first decade, 9 were added in the 1990s and 13 more buildings have been completed in the new millennium, 3 of them after 2010. The southernmost buildings along West street are some of the later additions, including Millennium Point from 2001 and Millennium Tower Residences from 2007, both by Handel architects, and The Visionaire by Pelli Clarke Pelli Architects from 2008. Further up, Liberty View and Liberty Court were built in 1991 and 1987. Brookfield Place, a complex of office buildings previously known as World Financial Centre, was designed by Cesar Pelli and was completed in 1985-87, except New York Mercantile Exchange which was completed in 1997. The skyscraper under construction on the opposite side of the road is 50 West Street by Murphy/Jahn architects. 15 Union Square West (right) was originally built in 1870 but its facade has been changed twice, from the original cast iron to white bricks to the current steel and glass facade with additional storeys, designed by Eran Chen in 2007. The neighbouring buildings are from 1890 and 1887, the corner building by Robert Henderson Robertson. The IAC building was completed in 2007 to a design by the architect Frank Gehry as the headquarters of InterActiveCorp. It can be seen from the high line, an elevated railway converted to walkway and park. It was opened in several phases, the first and second in 2009 and 2011 while the final phase was completed in 2014. The tower at the back is 100 Eleventh Avenue, completed in 2010 by architect Jean Nouvel. Next to IAC also stands Shutter House, completed in 2011 by architect Shigeru Ban, and a residential unit designed by Annabelle Selldorf. The twin towers under construction are by Thomas Juul-Hansen. Seen from East 9th Street, the modern buildings on Cooper Square are the New Academic Building by Thom Mayes from 2009 and, peaking up from behind, Carlos Zapata's Cooper Square hotel from the year before. The New Academic Building is an addition to the Cooper Union Foundation. The first building opened in 1859 on the northern side of the square, founded on the principle that education should be available to all who qualified, without cost. Designed by Frederick Peterson, it is the oldest existing building in the United States with steel beams used as spanning members. The use of steel as part of the load-bearing structure was first pioneered much later by William Jenney in Chicago with the Home Insurance Building from 1884, making it a contender as world's first skyscraper. Both the Home Insurance Building and the Tacoma Building by George Fuller from 1889 were hybrids, relying in part on structural members of masonry, meaning that the first pure steel skeleton was built in New York by Bradford Gilbert in 1889. Cooper square was renamed from Stuyvesant Square after Cooper's death in 1883. The square first opened in 1850. The block of buildings on 10th Avenue between 18th and 19th street includes several modern additions. 456 West 19th Street in brown brick, designed by Cary Tamarkin, and Chelsea Modern in wavy blue glass, designed by Audrey Matlock, were both completed in 2008. 459 West 18th Street by della Valle and Bernheimer followed a year later. Some 19th century buildings have survived in between, including the two small brick buildings on 18th street, built as stables in the 1880s. Beekman Tower (8 Spruce Street) is a residential tower built in 2006-10 to a design by the architect Frank Gehry and WSP Cantor Seinuk Structural Engineers. The image is taken from South Street Seaport, an historic district featuring some of New York's oldest buildings including Schermerhorn Row from 1811. Peck Slip was one of the many man-made inlets for the docking of ships created in the 17th century by the Dutch. It was filled in by 1817 and a warehouse from 1807 still survives at the northeast corner. One World Trade Centre is the tallest building in the United States and fourth tallest building in the world. Construction began in 2006 and was completed in 2014, to a design by architect David Childs of Skidmore, Owings and Merrill. The original concept for rebuilding the site after the terrorist attacks in 2001 was won by Daniel Libeskind in 2002, but many of his ideas were changed over the subsequent years, and the specific design for One World Trade Centre also underwent multiple changes after it was first unveiled in 2005. On the right, towering over the other buildings in Battery Park City stands the Goldman Sachs Tower from 2010 by Henry Cobb. Below One World Trade Centre can be seen 200 Chambers Street from 2008 by Costas Kondylis and 101 Warren Street from 2008 by Skidmore, Owings and Merril. The most prominent building on the left is 388 Greenwich Street from 1988 by Kohn Pedersen Fox. One57 is a 306 metre residential skyscraper completed in 2014, to a design by architect Christian de Portzamparc. It will be surpassed as the tallest residential tower in New York when 432 Park Avenue is completed in 2015. The tower has been nicknamed the Billionaire Building and includes the most expensive flat to date in New York. The lower levels are occupied by a hotel. It forms a small cluster with the CitySpire Centre from 1989 by architects Murphy/Jahn, Carnegie Hall Tower from 1991 by Cesar Pelli, of the same block as Carnegie Hall from 1891, and Metropolitan Tower from 1987. 837 Washington Street was completed in 2014 to a design by Morris Adjmi, featuring an extension of a 1938 industrial depot. The extension is a steel exoskeleton with a curtain of mullioned windows. The original project was twice reduced in height before being finally approved in 2011. It stands across the street from the High Line and the new Whitney Museum, designed by Renzo Piano and completed in 2015. 432 Park Avenue seen from Madison Avenue, the luxury flat skyscraper began construction in 2012 and is scheduled to be completed in 2015. Already topped out at 425 metres, it is the second tallest building in New York, though there are two more projects at similar height planned on 57th street. The design of 432 Park Avenue is by Rafael Vinoly. The site was previously occupied by Drake hotel, demolished in 2007. On the left can be seen Madison Avenue Presbyterian, completed in 1901 by James E. Ware & Sons. The red-brick building was built in 1931 by Fifth Avenue Bank of New York by architects Schulze and Weaver in a neo-federal style. It replaced a building from 1886.
and Tower Central Park by Thomas Stanley (1961, redesigned in 1995-92 by Costas Kondylis), The Sheffield by Emery Roth & Sons (1978), Central Park Place by Davis Brody Bond (1988), Hearst Tower by Norman Foster (2006), Random House Tower by Ismael Leyva and Skidmore, Owings and Merrill (2003), 1717 Broadway by Nobutaka Ashihara (2013), 888 7th Avenue by Emery Roth & Sons (1971), Essex House by Frank Grad & Sons (1931), One57 by Christian de Portzamparc (2014), Hampshire House by Caught and Evans (1938), Burlington House by Emery Roth & Sons (1969), Barbizon-Plaza Hotel by Lawrence Emmons (1930) and 30 Rockefeller Centre by Raymond Hood (1933). Midtown skyline seen from Central Park. From left to right: Park Lane Hotel by Emery Smith & Sons (1971), Solow Building by Gordon Bunshaft and Skidmore, Owings and Merrill (1974), General Motors Building by Edward Durell Stone and Emery Roth & Sons (1968), The Sherry-Netherland by Schultze and Weaver and Buchman and Kahn (1929), 432 Park Avenue By Rafael Vinoly (2015), Four Seasons by I.M. Pei and Frank Williams 1993 and the Pierre by Scultze and Weaver (1930). The General Motors Building replaced the Savoy-Plaza Hotel from 1927 by architects McKim, Mead and White. 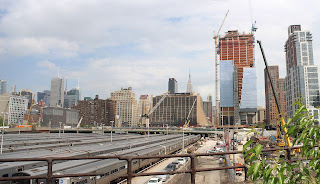 10 Hudson Yards, also known as Tower C or South Tower, is an office building scheduled to be completed in 2015. 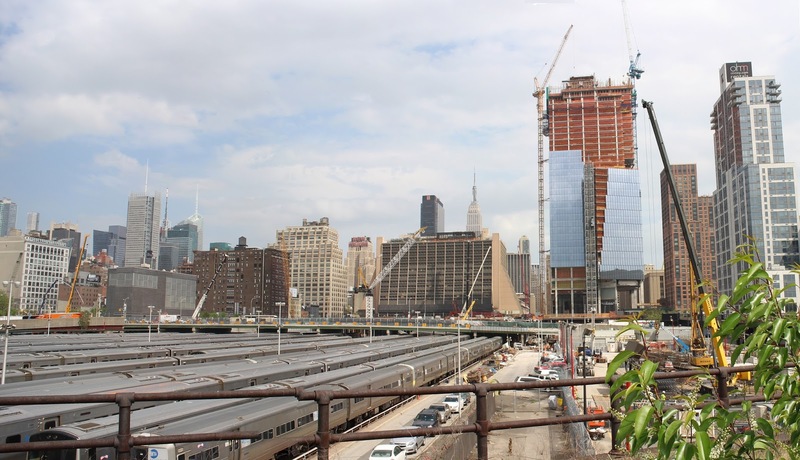 It is the first tower in the Hudson Yards masterplan, a redevelopment project consisting of 16 skyscrapers. The architect behind 10 Hudson Yards and the the masterplan is Kohn Pedersen Fox. The entire masterplan is expected to be completed in 2024. On the far left can be seen some of the tallest skyscrapers in New York, including the Bank of America Tower from 2009 by Adamson Associates and the New York Times Building from 2007 by Renzo Piano. Looking across from the recessed pools of the September 11 Memorial Plaza, the Museum pavilion and 4 World Trade Centre (right) have both been completed. Still under construction are 3 World Trade Centre designed by Richard Rogers and the transportation hub designed by Santiago Calatrava. In the back can also be seen Millennium Hilton, built in 1990-92 to a design by Eli Attia and behind 3 World Trade Centre, 22 Cortlandt Street from 1971 by Emery Roth & Sons, and One Liberty Plaza from 1973 by Skidmore, Owings and Merril. In the far distance can be seen the Western Electric Building on Broadway from 1961 by architects Shreve, Lamb and Harmon, which replaced the St Paul Building from 1898 by George Post. Also seen are 5 Park Row by Robert Henderson Robertson, the tallest commercial building in the world from 1899-1908, and Gehry's Beekman tower.